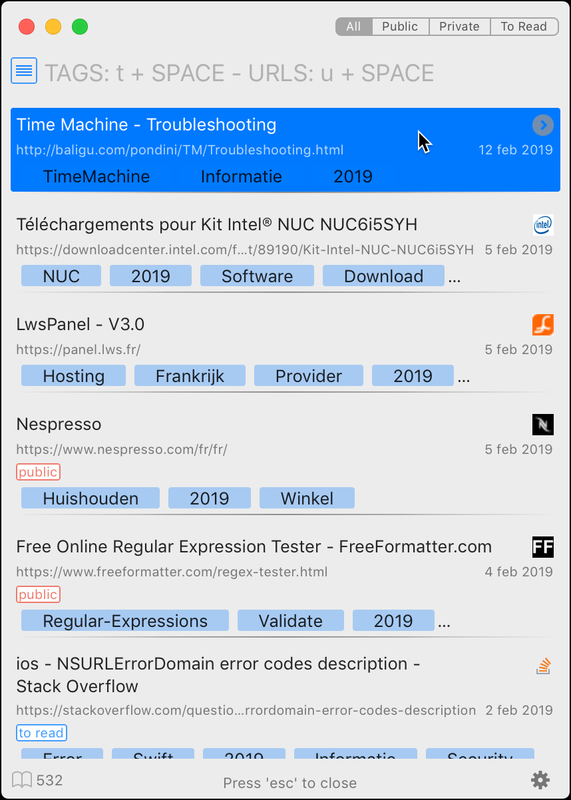 The fast pinboard.in client for macOS. If you have a subscription for the Pinboard bookmarking site, this is the application you want. Pinboard is a bookmarking service with no ads or tracking. With the Roofs application, your search for bookmarks is fast and simple. All bookmarks are buffered locally for an even faster experience. Only when there are changes on Pinboard.in Roofs will reload its data. A shortcut can open the search window, type and Return opens the wanted web page. No trip to the mouse or trackpad is needed. 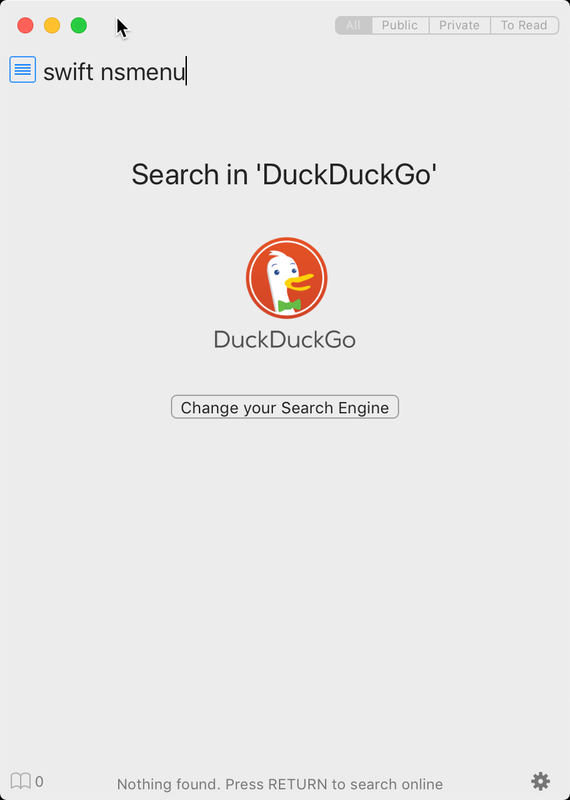 When there is no hit in your bookmarks, you can continue typing for searching in a Search Engine of your choice. Roofs will automatically adjust its appearance for Mojave's Light - and Dark Mode. When you open the application for the first time, you will be asked for the TOKEN from your https://pinboard.in subscription. When you click on the icon next to the TOKEN field, your webbrowser will open the page with your personal TOKEN (you have to be logged in for this). Press 'Login' and you will see all your bookmarks. The lastest ones you have entered are on top. If you prefer, you can show the lastest used on top. Also any dead link in your bookmarks will be noticed. Start searching by typing. The search is on title and description. However if you start your search with T space or U space, the search will be on tags or url's respectively. You can also change the search mode via the button at the left of the field. The first result is initialy selected. You can use the up- and down arrows to select another bookmark. Press Return and the wanted page opens in your browser (Roofs goes to the background). When there is no hit in your bookmarks, you can continue typing for searching in a Search Engine. This is all you have to know to get started. Of course you can finetune your settings as desired. Roofs can run in the background. You can toggle between regular- and background mode via a Status menu. 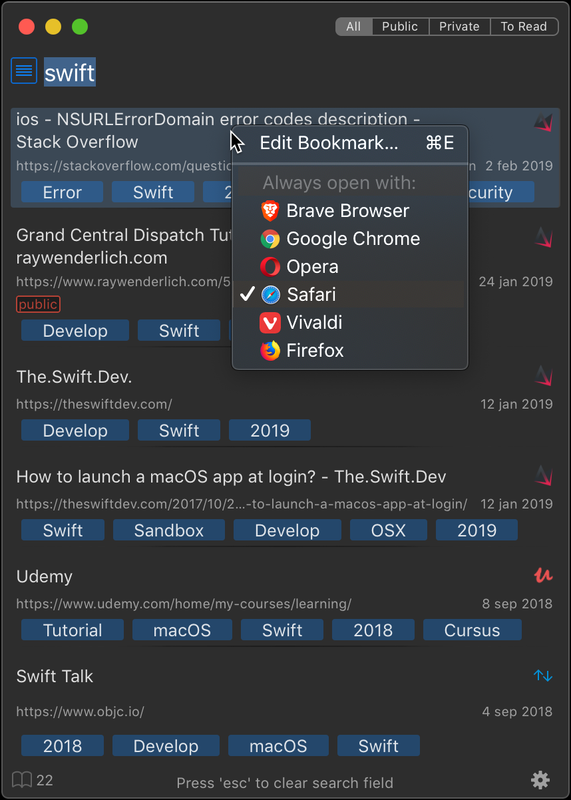 When you hit the trigger key combination, the program gets active and lets you start with searching for your bookmarks. Fast finding is the main purpose of the application. If you want to do more then just searching, you can do that on the Pinboard website. 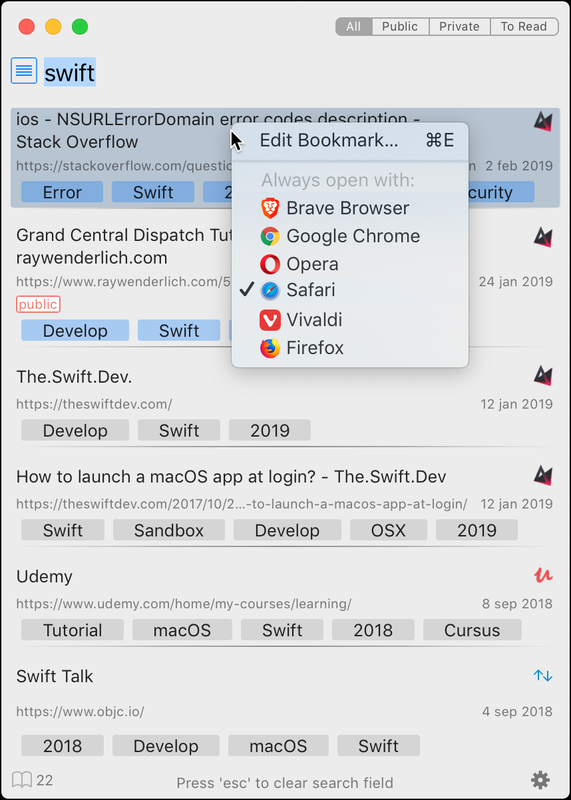 The easiest way, for example, to add a new bookmark, is by using one of the options for saving bookmarks offered by the website. In the New and Edit dialog you can adjust most of the bookmark properties. Typing tags is with auto completion for al existing ones. Also here all actions can be done with your keyboard (if you prefer). In the Settings you can change the activation shortcut (default is shift ⌘ B), tell your program to launch at login, choose what is your sharing default and more. 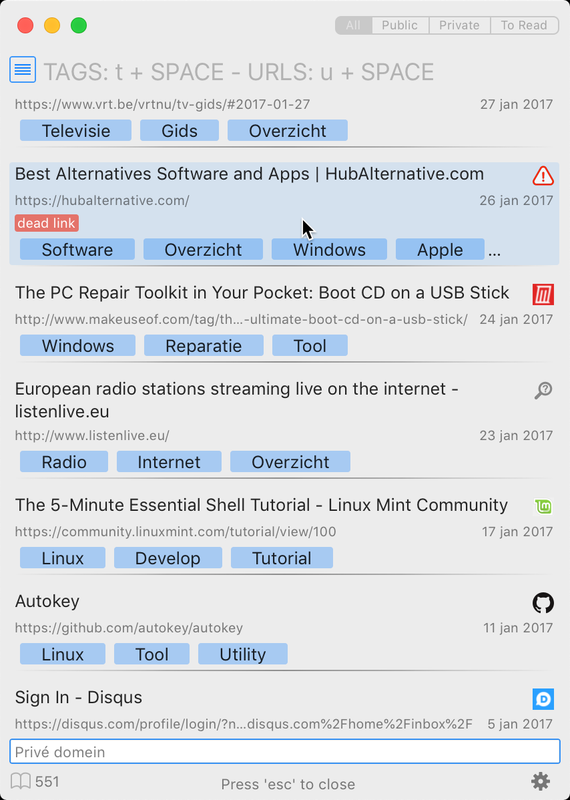 All bookmarks that are not your sharing default will be marked in the list. So if you have chosen for 'Private', every bookmark that is 'Public' will be marked. And visa versa. Normally you will enter a new bookmark via a browser bookmarklet offered by the Pinboard.in website. Roofs takes care of up-to-date contents. You can always go back or close a panel, by tapping the esc key. This application collects in no way personal data from its users. The connection to the Pinboard API goes via the https protocol to guarantee a secure communication. 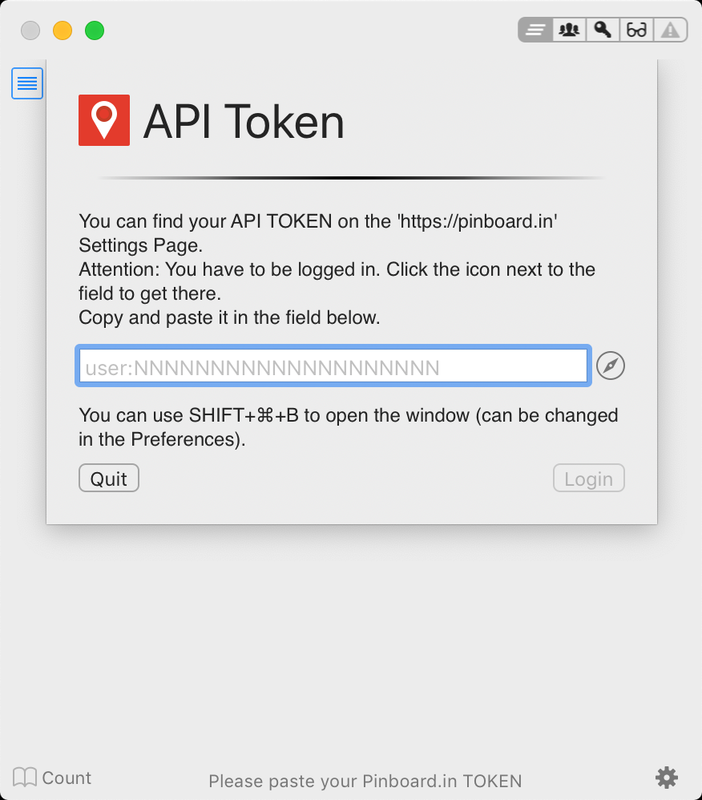 For connecting with the Pinboard API you use a token provided by Pinboard. This enables contact with your Pinboard account without having to store a copy of your password. A subcriber can always reset this token. The Roofs program has no connections with the https://pinboard.in website service. The website is the inspiration for this program.